(AP) LYTHAM ST. ANNES, England - Brandt Snedeker plays fast and talks even faster, and he was on a roll Friday in the British Open. He raced up the leaderboard with five birdies in a seven-hole stretch, tied the 36-hole record for a major championship and looked like he was bent on running away from the field at Royal Lytham & St. Annes. Along came Adam Scott, playing cautiously and picking his spots for three birdies on the back nine to pull within one shot. Not far behind was Tiger Woods, sticking to a conservative game plan and delivering a dramatic finish by holing out from the bunker to set off a wild cheer from 6,000 spectators crammed into the bleachers. As the second round ended, this Open was just getting started. On another benign day when the only concern was pools forming in the bottom of pot bunkers from overnight rain, Snedeker became the latest player to match the course record at Royal Lytham with a 6-under 64 that gave him a one-shot lead. He has yet to make a bogey over 36 holes, the first player to go bogey-free in the opening two rounds of a major since Woods won at St. Andrews in 2000. Snedeker's 10-under 130 tied the 36-hole record set by Nick Faldo in 1992 when he won the Open at Muirfield, and it broke by four shots the 36-hole record at Lytham. Even more amazing? Snedeker hasn't hit into any of the 206 bunkers in two days. "No bogeys around here is getting some good breaks and playing some pretty good golf," Snedeker said. "My mantra all week has been to get the ball on the greens as fast as possible. Once I'm on there, I have a pretty good hand for the speed of the greens. Just going to try and keep doing that over the weekend." Snedeker has never made the cut in three previous trips to the British Open, though this brand of golf is nothing new. As a rookie on the PGA Tour in 2007, he was 10 under through 10 holes on the North Course at Torrey Pines before having to settle for a 61. He picked up his third win there this year by rallying from a seven-shot deficit on the last day. "Brandt is a momentum-type guy, once he gets going and starting making putts and hitting shots," said Mark Calcavecchia, another player who doesn't waste time. "He plays quick and he's got the quick tempo and he putts quick. And they go in quick. That's awesome golf." What does that get him? "A whole lot of nothing," Snedeker said. "We've got 36 more holes to go. A lot can happen." And that was before Scott, the 32-year-old Australian, began making his steady move up the leaderboard. He bogeyed the third hole for the second straight day, and then turned it around by smashing a 3-wood that bounced off a hillock to the right of the green on the par-5 seventh hole and set up a two-putt birdie. Scott opened the back nine with back-to-back birdies, and then hit two beautiful shots to 8 feet for another birdie on the 18th and a 67. Scott, who had a 64 on Thursday, has never been in such good shape at a major going into the weekend. "Why I've played good this week is kind of a culmination of everything I've done over the last couple of years," Scott said. "I feel like this is the path I've been going down, and just happens to have happened here that I've put myself in good position after two days at a major." Much like Snedeker, though, he didn't reach much more into it. "I think you look at the names that are five and six shots back, and it means even less," he said. The biggest name was Woods. Woods mapped out a strategy for navigating the bunkers of Royal Lytham, and not even a change in the weather  only a breath of wind  will take him away from that. He has hit driver only three times this week. On the par-5 11th, where several players hit driver for a chance to go for the green in two, Woods laid back with an iron. He pulled it into the rough, and it cost him. Woods had to get up-and-down from behind the green for a bogey. That was his lone mistake, however. He holed an 18-foot birdie on the 16th hole, and then fooled by what little wind there was on the 18th, recovered by holing out from the greenside bunker with a shot that rolled into the cup for his second straight 67 and a 6-under 134. "It wasn't as hard as it may have looked," Woods said. "Because I was on the up slope, I could take out that steepness coming off the bunker and land the ball on the flat. So just threw it up there, and I played about a cup outside the left and it landed on my spot and rolled to the right." Woods will find out if his record in the majors still means anything. This was the eighth time he has opened a major with two rounds in the 60s, and he went on to win on the seven previous occasions  including all three of his Open titles. He will be in the penultimate group with Thorbjorn Olesen, a 22-year-old Dane who won for the first time this year on the European Tour. He closed with two birdies, knowing that the last one would give him a 66 and a chance to meet Woods on a Saturday afternoon at golf's oldest championship. "That was amazing," Olesen said. "He's been my idol in so many years. So it's fantastic to have a chance to play with him. And I'm certainly looking forward to it." The rest of the field would love nothing more than for the wind to show up. The forecast, which cannot be trusted in these parts, is for mostly sunny skies and perhaps enough wind to fly a kite on the shoreline of the Irish Sea. The blustery conditions are to arrive Sunday, which would make all those bunkers and the high grass even tougher to avoid and possibly allow others to get into the mix. Paul Lawrie, who came from 10 shots behind on the final day at Carnoustie in 1999 to win the claret jug, overcame two double bogeys to salvage a 71 and was in the group at 4-under 136 that included Graeme McDowell (69), Matt Kuchar (67), Jason Dufner (66) and Thomas Aiken (68). "The forecasts I've seen so far have all been wrong," Kuchar said. "So I don't put a whole lot of stock in what's coming. I think all of us would like to see some more British Open-like conditions. I think everybody would like to have a little bit more wind just to test us a little bit more out here." Ernie Els squandered some chances by missing a few short putts on the back nine, though he still carved out a 70 and was at 137. Luke Donald's day stated early, and not just with his tee time. His caddie, John McLaren, called to say his pregnant wife was due any minute. No matter. He used Gareth Lord  almost on the bag at Disney last year when Donald won to capture the PGA Tour money title  and he had a 68 to join the list at 2-under 138. Rory McIlroy bought a hotel room and gave some spending cash to the 16-year-old who was hit in the head by his errant tee shot on Thursday. The teenager watched on Friday as McIlroy only hurt himself. He took two shots to get out of a bunker on the par-3 ninth for a double bogey, had to play sideways out of a water-filled bunker on the 17th and wound up with a 75 to fall 12 shots behind. The cut was at 3-over 143  the 13-shot separation speaks to how well Snedeker played. Phil Mickelson never had a chance, taking three double bogeys for a 78 to end his streak of 18 consecutive cuts in the majors that dates to Carnoustie five years ago. Tom Watson, 62, extended his record as the oldest player to make the cut in the Open by holing a 35-foot birdie putt on the final hole. It was a fitting end to the day. Snedeker idolized Watson growing up, and he has just enough freckles under that strawberry-blond mop to resemble the five-time Open champion. He has learned to accept the odd bounces and embrace the Open beyond the links, hanging out in the pubs and appreciating the locals' love of golf. As for their games? 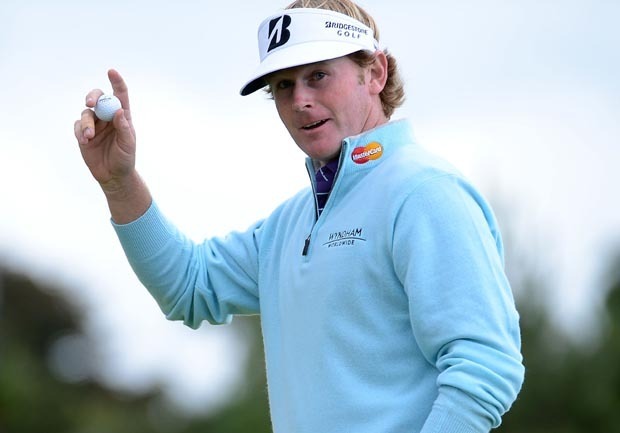 Snedeker doesn't hit the ball on the button the way Watson does  not many do. "I would love to be like him," Snedeker said. "We both make pretty quick decisions. There's no hold-back in either one of our swings. He's one of the best ball strikers of all time. I am not, by any stretch of the imagination. But I think we both hole a lot of putts. Tom in his prime holed a lot of 25- and 30-footers. And when I'm playing well, I tend to do that a lot, too."